I recall that in my teens, having read the word ‘ephemeral’ just once, I used it in conversation and mispronounced it, much to the amusement of one of my fellow students. 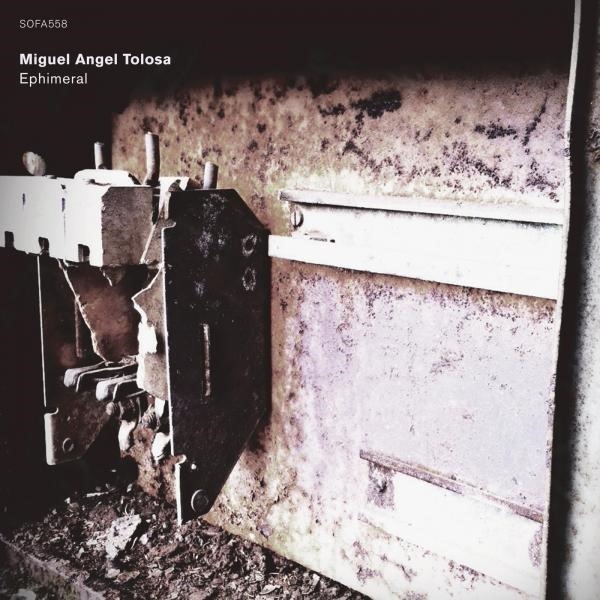 My phonetic pronunciation is replicated in the title of Miguel Angel Tolosa’s album. There’s little relevance to this anecdote in the wider picture, but that’s actually the point. It was a brief moment in time, long past and irrelevant and inconsequential on every level but for the fact that it lives on as a moment of embarrassment in my memory. And herein lies the relevance. Moments only exist in the moment: any record or document of the moment may change the context, the complexion and the enduring recollection of the moment, but in the context of the ongoing continuum of time, once the moment has passed, it’s past. There’s surely something of a contradiction in a recorded work centred around the concept of ephemerality. The very act of committing the sound to a recorded medium captures it in time, imparts a date stamp (literal or otherwise) and locks the moment for perhaps an eternity. Ephimeral exists within these contradictions. It doesn’t exactly explore them, but the compositions – individually and collectively – serve to create a fleeting atmosphere centred around transitions and contrasts. While the majority of the album’s compositions are preoccupied with ambience – wide, sweeping sounds, building ever-shifting cloud formations in sonic form, with the threat of a storm always looming but never becoming an actuality – there are other pieces which break the mould of fleeting, fractal aural nebulousness to coalesce into something denser, if not necessarily more tangible or readily compressed into structured musicality. The album starts dark, ‘Rio de Cristal’ dominated by an undulating low-end drone, which segues into ‘Tropismos’, on which a dark, murky swamp of sound is rent with barrages of grinding noise and attacks of snapping shrapnel akin to machine gun fire. It’s the kind of aural experience that makes the skin crawl and the nerves jangle. Light and dark are juxtaposed throughout, often simultaneously, with menacing chords and notes which scrape like metal against fillings filtering beneath soft, expansive clouds of sound. And perhaps it’s in the experience and the sensations this music provokes within the listener that the ephemerality of Tolosa’s work is truly apparent. The listener is left chasing fragmentary thoughts and feelings, often conflicting, arising in response to the simultaneous aspects of the music. So how does Ephimeral leave you feeling? By turns elated but tense, strained but calm, and ultimately confused and conflicted and adrift, at odds with oneself.